This post is all about the cost breakdown of Ecuador. Compared to my city posts, the charges will be listed more detailed (all in USD). I hope this page will give you a rough understanding how much you’ll need for your trip here. I don’t consume much alcohol in general. Not sipping any drinks helped me keep my costs down, but if you are planning on drinking, then assume that one bottle of beer will cost you around $1.5. This of course will vary by region and on outlet (restaurant or store). One guy in my hostel told me he got charged more by the vendor for taking the beer bottle to go. He assumed that the restaurants collect the bottles and get money for recycling them. He returned the bottle to the vendor and tried collecting the container deposit at the restaurant, but at no avail. Maybe because of language barrier or assumptions that a foreigner wouldn’t know? I’m not sure. Overall, there are ways you can save more money than I did, but also easy to exceed my spending. I budget well, but will spend a little extra to get the cultural experience (local food) and activities I like. Choosing is a constant balancing game. Debating if I should or shouldn’t pay an extra $1 for the street snack and experience something new, or side with my wallet. $1 might not seem much, but many bucks will add up over time. Thank you for baring through all the numbers. This article might be a little overwhelming in information, but I truly hope that this post is of use to you. If you have already been to Ecuador, how much did you spend? Do you have any money tips for other readers? Please leave your remark below in the commenting section. The last city in Ecuador was Cuenca for us; abundance of restaurants are in the foodie-capital. For me, I tasted more flavorful meals than I have in the rest of the country, which doesn’t seem to value the usage of spices. I’m a pretty bland cooker myself (health reasons), but I wouldn’t have complained about some extra salt. Extra sodium please! A lot of my previous meals have been plain white rice, beans, and a choice of overcooked meat. Guayaquil had amazing food too, but in comparison to that city, Cuenca still charges the low prices. Besides munching food, we also checked out the free cultural museum across the street from our hostel (I highly recommend the Alternative hostel). They also displayed historical Incan ruins that were probably used for military purposes. A school had a fieldtrip that day and we barely managed to avoid being flooded and drowned by munchkins. Yay, for strategic placement…. If the ruins are not what fancies you, then the attached garden is lovely to mosey around, even have exhibits of a few birds. From there we headed to the historical center to check out some impressive cathedrals. Incan Ruins and unique flowers in the neighboring garden. In general Ecuador is fun to explore while being budget friendly (ignoring Galapagos). I stayed here for 17 days (May 17 to June 3, 2016). My favorite experience was snorkeling in Galapagos, since I’ve never done this activity in such clear water, but if you are on a tighter budget, there are other locations with beautiful snorkeling spots. My least pleasurable experience was with the Kiwi hostel. There was just so much wrong with the hostel and the staff gave bad solutions to the problems or none at all. If the room smells so musky we can’t breathe, please don’t suggest allergy pills. One other positive part about Ecuador, which one might not notice until they are there, is that most of the locations we went to had any, or almost any, mosquitos! Much nicer to explore without constantly ducking and swatting away bugs. Prefer not to look like a crazy person from the distance. A habit I had to break is about toilet paper. Ecuador is not the only country that does this, but here you shouldn’t throw the toilet paper into the toilet because the paper will clog the drainage system. Instead there is a trash can next to the toilet for the disposal. Not that this is a hard task, but that’s not what I’m used to doing. The first couple times I would forget in the moment, but refused to go fish it back out… for obvious reasons. Another interesting thing about Ecuador is that the buildings have an interesting finish. Many houses are constructed with brick. From there they put on this plaster to make the outside look nice and smooth, but often only the street side of the building gets this plaster and not the entire dwelling. Hence from the main street the housing appears finished, but then the alleyways tell a different story. Galapagos has an awe-striking view. At the waterfront you have clear, blue water as far as the eye can see. We stayed on the main island, Santa Cruz. There is a lot of activities you can do here and then do day trips to do on nearby, smaller, uninhabited islands. These unpopulated island would be the dream home location for my introverted travel buddy who didn’t hide his thoughts from me. Charles Darwin Research Center was our first main destination. The center is an easy 15min walk away and totally free (my favorite price). Here we learned a little more about how Galapagos got its fame and what society is actively doing to preserve the islands for nature and the domestic animals. They also have a giant tortoise breeding station and we got to see some of the turtles and iguanas. In the evening the waterfront dock is a hotspot. The lights mounted under the dock attract fish, which in turn lure small sharks, sting rays, and pelicans. All the wild animals is my favorite part about Galapagos. I’d be walking to my destination and suddenly I come across a creature and they get reaching-distance close. Perfect selfie conditions. The sea turtle I swam next to the following day gave me butterfly-excitement. We took a snorkeling tour to La Fe and Pinzon Island. So I was in the midst of many swarms of tropical fish and encountered a blue footed booby as well. Because of the clear water, spotting the different fauna was easy and I got to get a good look at them. Definitely go snorkeling at least once if you get the chance. On the second snorkeling spot, we came across a huge current. I’m an experienced, fit swimmer and I struggled swimming past. The guide wasn’t very good at making sure all his flock were together. There were two stragglers in the back and I thought they were taking their sweet time observing the fish. My friend on the other hand mentioned that they yelled something across the water. So we swam our way back and I asked them if they were ok. They were not. Being fatigued, they couldn’t make their way past the current. I grabbed the hand of the one Chilean woman and prayed that I could push through a second time while taking along another person. Pure joy when I arrived at the boat. And a mini hero was born. Recovered from the swimming, the next day we headed to a lava cave as well as a tortoise ranch. In the name of on-a-budget, we tried to be smart and take a local bus instead of an expensive cab. Everything seemed to go smooth until we got to our stop, Santa Rosa, and still had to go to the next town over with no second bus or cabs available there. Without us asking, the local lady sitting next to us inquired where we were going and tried to get a cab arranged because she thought on foot would be too confusing direction wise and too far. Super friendly, but we ended up walking anyways. I think the stretch took us 30min? Not so bad. Leaving our destination we had to walk the same stretch and then hitchhike on a random, bypassing bus that was going to our town. Check out my post on ‘Baños and Guayaquil’ to see how the busses work. We did end up saving $28 each for not taking the cab. 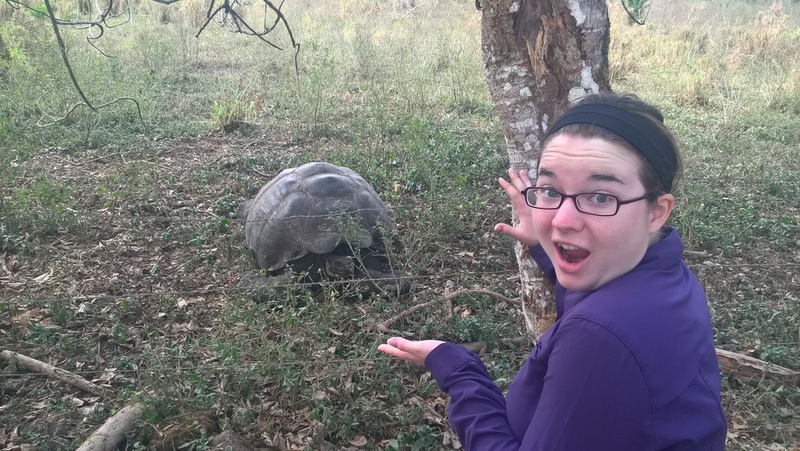 At the actual ranch, we meandered and got to see turtles that were bigger than me if I rolled into a ball. They were huge! Takes a turtle at least a century to get that size. These turtles are not fenced in. If I ignored the signs, I could have easily touched every single tortoise I encountered. At the same location, the lava cave were nice and cool. There were three separate small caves to go though. Before and after our sightseeing there, we drank complimentary tea and coffee at the ranch, relaxed and enjoyed the ambiance. The next and last excursion on Galapagos was to Isabela Island. Isabela Island is another larger, populated island and there is only 1 method of transportation offered to get across the water, and hence overpriced at $30 USD for a one-way, 2 hour boat ride. This does not include the water taxies you have to take from the dock to the boat. In the end we each paid $63 USD and a surprise $5 USD entry fee at Isabela. Most tours offered on this island are day tours which don’t come back until the evening. Unlike us, I would suggest that you spend a night on the island to get to savor the scenery to the fullest and get to explore parts of the island which are further away from the dock. We took a stroll down a pathway where we saw flamingos. This way contained various plants and gave the feeling as if we were meandering through many different ecological systems, and at the end, we stopped at a tortoise breeding center. Galapagos overall is extremely exorbitant and not a place for people without deep pockets. Even the food is triple the price compared to the rest of Ecuador. In hindsight, maybe a future trip separated from my budget-conscious backpacking trip would be better so I’m less sensitive of my dwindling wallet. I’m still glad I went and to have all these precious memories I can keep with me forever. The fancy bus ride to Baños was something. I tell you, use the bathroom before you go because even though you are driving for hours, restroom breaks don’t exist. Other than that, entertainingly enough, throughout the bus ride the door is wide open for people to easily hop on and off. Street vendors use this to their advantage as they step on as the bus slows down, attempt to sell their items (mostly food) and then take their leave as the bus halts again. This method seems to be usual outside major cities. In the outskirts they don’t have established bus stops, but you wave the bus down as the vehicle approaches you. Feels much like hitchhiking. In Baños we were greeted with my first rain of the trip. This town is compact with everything a tourist needs at its center. The town doesn’t have much to offer within its walls, but the natural surroundings are stunning. Located in a valley, mountainous terrain encircles with multiple waterfalls nearby. The adventure capital of Ecuador has multitudes of sports to offer such as rafting, horse back riding, hiking, bungee jumping, paragliding, zip lining and much more! Having some bad luck picking our first hostel, we spent some time on the first day transferring to a better option. Afterwards we hiked to an exhausting-to-reach peak. My legs were dead. We took 2 hours to get to the top in hopes to sit on this famous swing which supposedly has an amazing view down to the valley. I’m not sure what happened, according to the locals we encountered there, we were 20min walk away from the swing, but we couldn’t find the pathway. So we threw in the towel and made our way back down on a different way with a less steep incline. I love swings and was disappointed we didn’t find it, but I wouldn’t describe the trip as a waste because of the views we got to enjoy. The view from the top of the mountain. Sitting on the best bench ever. Day two we spend whitewater rafting. My first time! I’m sure the movie playing in the bus to the destination was inappropriate, but fascinating never the less. Next I will demonstrate why you always have to explain everything like others are clueless. The guide told us we had 2min to change into our wetsuit without instructions. I never put one on before and in my rush didn’t pay attention. Probably screwed up wearing a wetsuit the most anybody could screw it up, backwards and inside out. I felt smart. At least I wasn’t the only one exceeding at failure. In the water the guide explained to us some simple rules and off we went. Our river was a level 3 out of 5. Rafting was oddly relaxing to me. We hit some waives and worked together to paddle out to safety, except once three people in the other boat fell out. The guides made a big deal about not loosing our $45 paddle and in the end our guide ended up dropping his own and having to swim after it. I chuckle at these ironies. In the evening we planed on stopping by a natural mineral bath. Luckily we decided to check out the waterfall next to the facility before. From there we could overlook the bath area and evidently the pool was overcrowded. People carefully have to weave themselves through the mass. This was not the relaxing atmosphere we were searching for, so we turned around and headed back to the hostel. 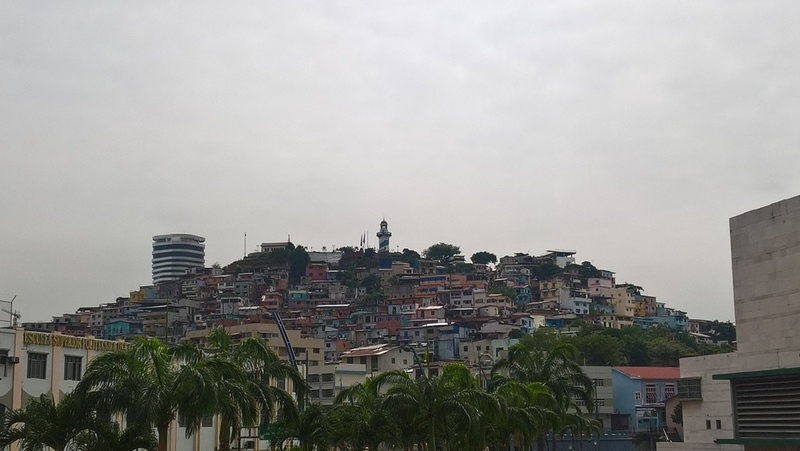 The following morning we jumped on the bus to Guayaquil. Guayaquil was pit stop for us to take the airplane to the Galapagos Islands. Prices here seem more expensive than what I’ve observed in other Ecuadorian cities. If you get the time, definitely stop by the downtown waterfront though. Gorgeous. I was blown away by the wide sidewalk and the details the city invested in. Being a Tuesday morning-ish, almost nobody was utilizing the sidewalk and we strolled undisturbed. On one side, I had the water, on the other, various gardens to explore. On top of that, there aren’t any shortcomings in statues along the way. Even tough I’m glad that we spent that day in Guayaquil, my excitement for upcoming Galapagos was not to be hidden. Islands and wild animals sound glorious. Stay tuned for my next blog post! First impression of Quito, that the residence here are very friendly. Many tried to start a conversation and were not shy about informing us about the city and the nearby attractions. And I haven’t even gotten of the plane at this point, but the impression lasted. My plane touched down late night, around 10:30pm. The cab ride from the airport to the hostel was roughly 1 hour. We, my college buddy and I, went straight to sleep. Each morning the hostel offers complimentary breakfast; so I munch on yoghurt, banana and toast with a sip of tea for my fueling breakfast. First thing on the agenda for Quito is to explore the city. The struggles were real trying to get onto the bus platform. We didn’t realize that one side was the entry and the other was exit only. Failing, as we tried to force our way through the full height turnstile gate. Luckily reading signs is very helpful and we discovered the error of our ways quickly. We meandered all over, viewing various statues, parks, churches and colonial city buildings, which are in need of some TLC. There is an abnormal amount of police on the streets patrolling (always with their lights on) or directing traffic even if there is an operating street light. Cabs are never short at hand. The weather being cloudy, I wrongly concluded that sunscreen was unnecessary; just to end up with a lovely pink hue on my face. Late afternoon we stopped by the grocery store to pick up some items. My favorite was choosing random fruits we weren’t familiar with to test them out. The yellow pitahaya (dragon fruit species) had a savory, sour flavor and I would recommend everyone to try the fruit out or you are missing out in life. The next day we hiked Pichincha Volcano (elevation of 4,784 m (15,696 ft). The first part was painless as we took the cable car, but then we had to work our way up a steady, rising incline. Breathing proved more difficult than usual in the high altitude as my untrained self had yet to acclimatize to the lower oxygen levels. The 3 hour skirmish was well worth the magnificent views of the surrounding mountains and the city below. This mountain probably offers the best views of the area and if laziness strikes, one can rent a horse which are located after the cable car ride. After our excursion, we needed to still our hunger. For mere $2 I got some local soup, an entrée (rice, beans and chicken), a tiny slice of watermelon and a beverage. Not a bad deal. Then we tried our luck again by getting a foreign fruit. I had to research the name of the fruit online, but the pepino melon left me disappointed. I’m glad though to have gotten to try the fruit since 20 cents is worth a new experience. Overall Quito has been pleasant. Being rated the most likely city to be pick-pocketed, I didn't come across any issues or discomfort. The web makes this city sound way more dangerous than reality. With a healthy amount of common sense, anyone can enjoy this place like any other city.